2019 marks our 51st anniversary! Happy new year to us - and you! 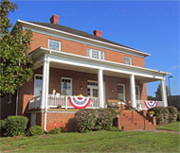 The Franklin County Historical Society was chartered by the Commonwealth of Virginia in 1968 for the purpose of collecting and preserving the history of Franklin County, Virginia. In later years, we added "sharing" to our mission. Our over-riding goal is to present history accurately and fairly. Huge thanks to our unsung hero(es) at Howl'n Dog Designs in Boones Mill! Not only did this company design our website - and continually offer support - Howl'n Dog also hosts the website for us (translation: pays the fees). Short commercial: if you need a newsletter, a website or a myriad of other techie type things done - call 'em up. We offer memberships to the general public to encourage interest in local history. We operate a history museum and research library to provide public access to our collected materials. Old times are not forgotten in Franklin County, Virginia...let us show you or your group around. A variety of tours, in and out of the Town of Rocky Mount, are offered to groups of all sizes for a minimal per person fee. Lunch is provided, if you wish.